Atomos Connect Convert Scale Analog to SDI/HDMI allows you to connect Composite/S-Video, analogue DVI and component video sources to SDI and HDMI devices, with resolution and frame scaling from SD up to HD 1080p60. Link legacy video sources to modern digital displays with the Atomos Connect Convert Scale Analogue to SDI/HDMI. Whether you need to ingest analogue archival material for modern media output or use analogue hardware with more up-to-date consumer or professional displays, this Connect Convert box has the connections for the majority of common sources and displays. Three BNC connectors can be used to accept component, S-video, or composite signals, while the DVI input is VGA and HDMI input compatible as well. Using internal processing, input video can be deinterlaced and scaled up to 1080p60. Mounting ears are included for semi-permanent installations. 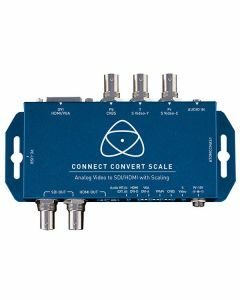 Just like the SDI and HDMI connections, the Atomos Connect Convert Scale Analogue to SDI/HDMI’s DC power connection is locked in with a screw thread sleeve that secures the power connection in place. Each converter comes in a streamlined metal housing with detachable mounting ears, creating flexibility for Broadcast and ProAV applications. Aside from mains power, there are options to power the Atomos Connect Convert Scale via USB, delivering the ability to run for hours from simple smartphone power banks or TV USB sockets.